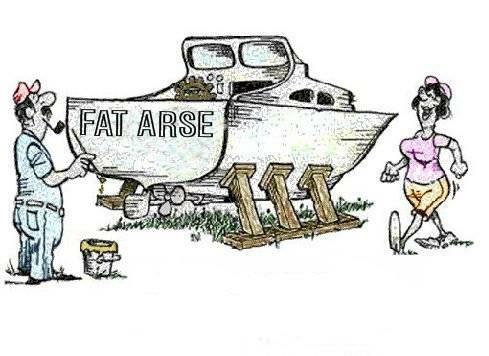 You know that cartoon about the bloke who names his boat after his wife..........? Someone I sailed with many years ago was rather amused by a boat in a nearby berth called "Brown Bomber". It seemed to have some meaning to him.... but I think he was getting confused with "brown hatter". We used to hear a boat called "Shy Talk" forever wittering away on the VHF. I've never heard so many requests for "Radio Check" from a single vessel! Oh Lord, not another blog! Seen by a friend many years ago in Greece"Midlifecrisis"
'Norman Stanley' painted on the transom.. I quite like Two Degrees, funded from the guys savings when both of his kids decided not to go to Uni. Told the tale that a keen racer showed his latest pride and joy to his wife Ruth. She wanted a cruising boat not a racer and replied "I am never going on that". He named the boat Ruthless! What about "Bootle Bum Trinket" what is that a reference to?